.... "Save an average of 8-10 minutes in loading and unloading times alone" That might not seem like much but it will help produce proven results in your profits. Less employee shop hours has to equal more profit.....right? 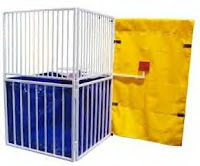 "Now You Can Get The Dunk Tank Loaded and Unloaded In Half The Time it Normally Takes!" My name is Bryan Payseno, and I've been renting and building inflatable games for over 18 years... and my experience and tips can help you save time, MONEY and make your job easier. But don't just take my word for it. Ask the hundreds of "Inflatable Specialists" whos jobs and lives are easier because their offices, trucks and warehouses are set up with the key tools for success in our industry. Believe me......many "Entertainment Specialists" have been in the EXACT same spot you're in right now...I, like many of you, have had my hand in every cookie jar. I've "owned" every job title. Spent years pinching pennies and cutting costs and honestly........working like a zombie just trying to handle the countless events scheduled for the month! and a bit more automated. It's such a simple product but it really cuts down on the work load. ... and I'm the best person to help YOU!" "I'll be blunt: I want YOUR business!" See, it helps my business more when I work with people who are serious about their success... because the more money they make, the more strategies I can show them that will make them even MORE money. So Take a look at some of products, resources and my "Fundraising Strategies" to make you more money and your job easy and fun again!